We were asked to build On-Air graphics for a rebrand of BBC World’s Talking Business show with Aaron Heslehurst. The new design of the show includes some sequences involving keyed graphics over a locked-off camera shot. We were tasked with taking a Cinema 4D rendered sequence and turning it into a real-time template graphic running on a Vizrt graphics engine. 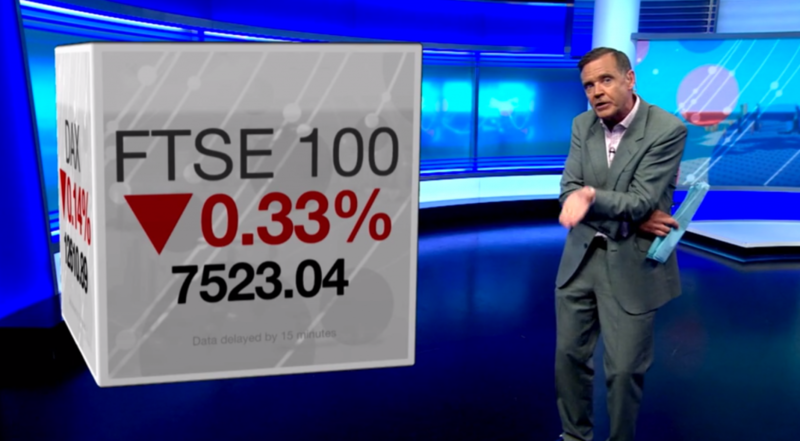 The content the graphic has to support ranges from images and text to live stock market results which need to update while the graphic was in vision. The design of the cube was dependent on a false camera perspective, so we weren’t able to use all the 3D assets from the original render. However we were able to use the original animation, and through a very subtle cross-fade blend between a pre-rendered video and the live 3D cube. The animation resolves with the real-time cube dissolving seamlessly to another rendered sequence. This gave us the best of both worlds, preserving the quality of the original animated rendering (with its complex ambient occlusion and motion blur) while allowing the content to be completely driven by the production team. In addition we built some templated full-frame graphics for the show, with branded live market boards and a new ‘trending’ graphic featuring views from conventional and social media. You can see some of the sequences we built in the video below.